One of the variants of Jaguar's most luxurious, it is only a 4-cylinder engine equipped with a 2.0 liter. However, with the addition of a turbocharger, a sedan weighs 2 tons is able to issue a power of 240 hp at 5,500 rpm and torque of 340 Nm at 2,000 rpm range up to 4,000 rpm. 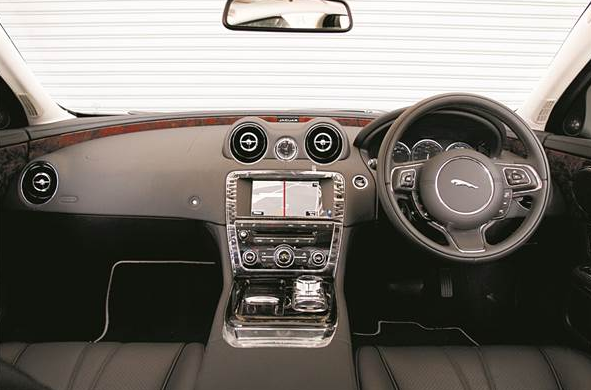 British car uses 8-speed automatic transmission tech Jaguar Sequential Shift to transmit engine power to the rear wheels. 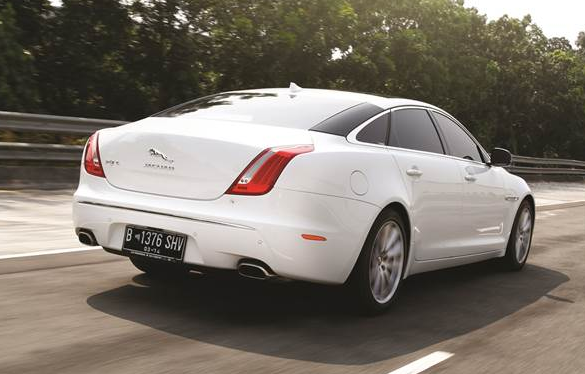 Jaguar XJ is able to bulldoze claims 0-100 kph in 7 seconds to reach a maximum speed of 241 kph. Stop / start system had been available on the XJ 2.0 is to improve fuel efficiency. When starting the engine, the sound is barely audible inside the cabin. As soon as the gas pedal, the response 2.0-liter engine feels quite qualified to drive a luxury sedan. Although not exactly privileged of engine performance and acceleration, but the sense of driving the XJ 2.0 L is very comfortable. Gearshift with 8-speed automatic transmission ZF mixing it feels smooth. Unfortunately it still feels there is a lag between the time response of the accelerator kickdown with engine response. Accelerates the driving modes D and S are also not too pronounced differences are striking. Just rev the engine is higher when using the S mode. With aluminum body and a good response to steering wheel makes maneuvering on the highway is also quite agile. Symptoms of oversteer when bulldoze the bend can be easily eliminated by feature Adaptive Dynamic and Dynamic Stability Control. As information, the fuel consumption when driving on the highway recorded around 11.1 kpl in MID, but when stuck in traffic consumption rose to 9.1 MPA. One unique feature, when in automatic mode, the transmission module will detect the driver's behavior by monitoring acceleration, cornering, braking up way. If in aggressivly driving then the transmission shift faster. From the exterior, the front view is typical Jaguar with an elegant contemporary design that is dominated by a large grille with chrome. From the side, a black Jaguar accent on the D-pillar is quite beautiful. On the back there is a vertical rear lights with LED technology dual exhaust that gives the impression of sporty. Panoramic glass roof can be adjusted electronically open the lid. Auretian alloy wheels measuring 19 inches being the only differentiator in the exterior with the previous version. When entering the cabin, luxurious impression was strong on this car. All parts of the cabin is clad predominantly black high quality leather material. Chrome and wood accents also adorn some parts to enhance the sporty and elegant. The front seats are electrically arranged. Behind the wheel, there are paddle shift to enjoy the sensation of driving a manual. The instrument cluster has adopted digital technology that displays information about the condition of the car. The entertainment system was of high quality, with an 8-inch touch screen that can play music, DVD, TV Tuner to navigation. 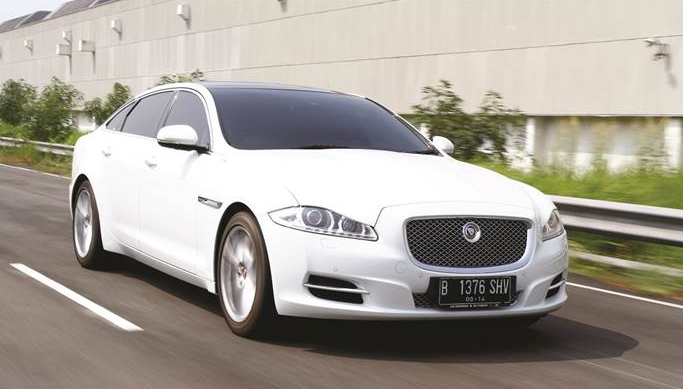 Jaguar combines entertainment system with speakers alerts Meridian Sound System 380 Watt power. Jaguar fully understood how pleasant customers. With increasing the wheelbase, the legroom for the rear passengers feel comfortable. The rear seat has adopted a system of 'airline seat' adjustable slope and back and forth. This seat is also equipped with a massage-which has three different settings. Consumers can enjoy entertainment from 8-inch screen is available for each rear passenger. Jaguar XJ 2.0 L deserves to be an alternative for consumers who are bored with the German luxury sedan and not too concerned engine performance.